The Primetime Emmy Awards: This year the academy's Governors Ball got an imaginative enchanted forest theme, produced and designed by Sequoia Productions, led by Cheryl Cecchetto. 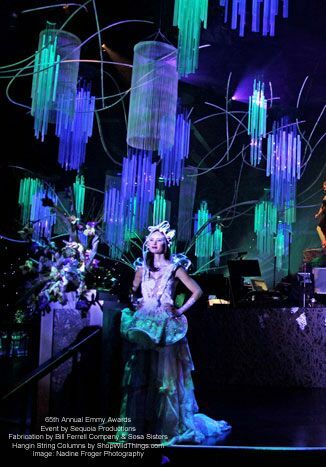 Decor included stylized trees and an expansive canopy of futuristic faux foliage hanging overhead. Bill Ferrell Company and Sosa Sisters handled the scenic fabrication. ShopWildThings was asked for the 5th year to participate in this beautiful event in a major way. 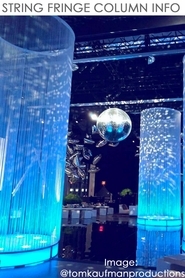 We constructed those beautiful huge hanging columns made out of our wonderful fringe string panels. We'd love to work on a project for you, too! Our string columns come in sizes from 1 Foot in Diameter up to 4 Feet in Diameter! The lengths vary from 88" (or shorter, just cut the length with scissors!) up to 20 Feet Long! We can make any color you choose with a minimum order, or pick from our in-stock color options. You can also make the white fringe columns look any color by simply directing light at them, as you can see from the images below.